Berlin: The dead begin to repopulate a small Québec ghost town in Denis Côté's strangely arresting Twilight Zone story. A film that’s every bit as bleak and fragmented as its title implies, Denis Côté’s “Ghost Town Anthology” is a pointedly modern portrait of a place that’s come unstuck in time. The fictional hamlet of Irénée-les-Neiges is located in a barren stretch of backwoods Québec (the director’s usual milieu, parts of which can also been seen in the likes of “Curling” and “Vic + Flo Saw a Bear”), and the 215 people who still live there are almost as dead as the trees in winter, or the local economy since the mine shut down. 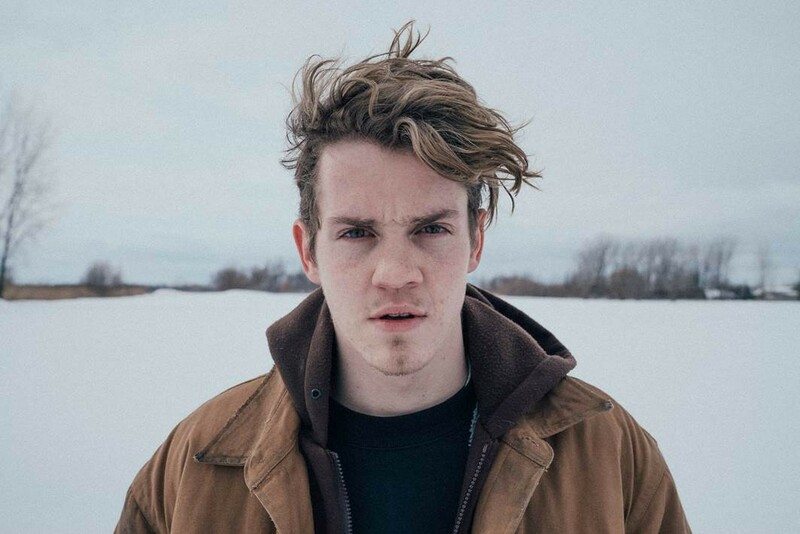 Simon Dubé, the 21-year-old hockey player who crashes his car into a cement wall in the opening scene, is just a little bit deader than the rest. His departure sends a destabilizing shiver through everyone who knew him; one of the many characters in Côté’s small mosaic likens the community to a house of cards that won’t be able to sustain itself in Simon’s absence, as if the young man’s suicide violated the residents’ unspoken pact to pretend that their little corner of the globe was special and worth preserving. His body isn’t even buried in the ground before the world turns upside down, traces from the Twilight Zone seeping into the surroundings like bits of dust through the crack in a broken snow globe. Mischievous, Jawa-like kids in strange masks can be seen running down the streets. People begin to see human silhouettes in their living rooms. Jimmy (Robert Naylor), Simon’s older brother, is visited by his late sibling at the rink one night. Irénée-les-Neiges has been a ghost town since God knows when, but only now is it starting to feel haunted. Adapted from Laurence Olivier’s 2015 novel of the the same name, the lethargic but gradually arresting “Ghost Town Anthology” is a story about a frigid place full of cryogenically frozen people who are waiting for the past to come back; about how they get their wish in the most literal of ways, and then can’t bear to admit that the dead are really no different than they are. 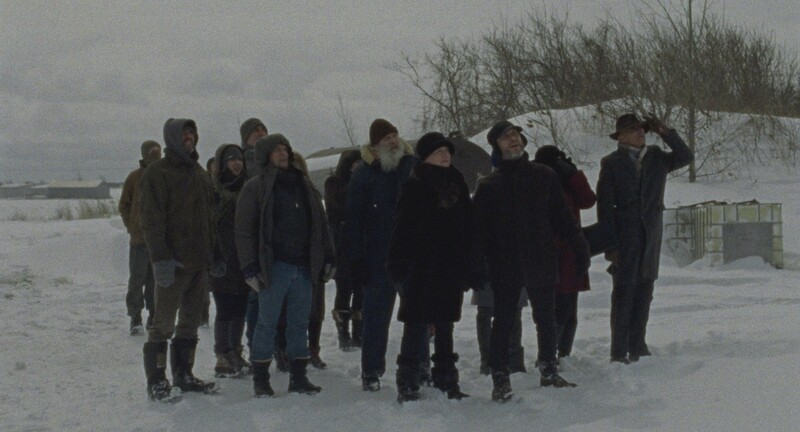 Shot on a 16mm stock that makes its Québécois’ environs look raw and moribund in equal measure, Côté’s film is impressively suspended between social-realism and the supernatural in a way that errs closer to the lo-fi spirit(s) of Kore-eda Hirokazu’s “After Life” than it does any of the horror movies its premise might call to mind. Which isn’t to say that there aren’t unnerving — even terrifying — moments to be found under the gray skies of Irénée-les-Neiges (brace for a small handful of jump-scares and a number of eerie insinuations), only that this inert little parable finds more to fear in the attitudes of the living than it does in the appearances of the dead. Slow to a fault and perhaps a bit too scattered for its own good, “Ghost Town Anthology” is in no hurry to arrange its characters into the recognizable constellation of xenophobia they eventually come to represent. Côté uses Jimmy as a way to get the ball rolling; his grief-stricken desire to receive a sign from Simon is the closest thing the narrative has to a spine. Next is his mother, Gisèle (Josée Deschênes), who might be too rattled to stay in town for much longer. The alcoholic Mayor Smallwood (Diane Lavallée, whose dryly comic performance carries more than a whiff of Helen Mirren) is on the other end of the spectrum; she’s as stubborn as they come, and her identity is inextricable from Irénée-les-Neiges. The mine’s closed? So what. That guy killed himself? It happens. The town’s deceased former residents are starting to reappear on the properties where they used to live like a silent army of benevolent zombies? “Human beings adapt,” she says. “Life goes on.” Even after death, it seems. There’s also a woman named Adèle (Larissa Corriveau), and a bickering couple of baby boomers who look down on her because she’s on welfare. There’s a handsome restaurant owner named Pierre (Hubert Proulx), and his girlfriend (Rachel Graton) who dreams of a better life. There are several characters in whom Côté takes a much greater interest than we do — characters that play key parts in the narrative, but are distinguished only by their various reactions to the muted terror that spreads through town. Sure, it’s horrifying to see the lower part of a strange man’s legs standing at the top of the stairs, but were any of these people this freaked out when the mine shut down and the town began to suffocate? Nobody seems to be as perturbed about their prospects for the future as they are by the sudden appearance of the Montréal-based Muslim woman who’s been sent by the government to provide assistance. She’s only seen for a moment or two, as Côté seems deathly — exasperatingly — afraid of stretching his metaphors into more explicit forms of social commentary, but her brief presence is enough to galvanize “Ghost Town Anthology” into a low-key horror film about our fear of the other. Even when things are as grim as they could get, this obdurate white collective is less afraid of the horrible certainties they’ve created (and normalized) for themselves than they are of the harmless unknowns who start to appear in somnambulant groups across town. And don’t forget, the dead were there first. On the other hand, the film’s most effective trick is how it tempers the response to the walking dead. Sometimes they get too close and people freak out, but viewers in the audience will often be more frightened than the characters they’re watching on-screen. Most of the time, the current residents of Irénée-les-Neiges seem more annoyed than anything else, as if they resent these uninvited guests for revealing how little the townsfolk are actually doing with their land; as if their shared claim to this sterile corpse of an inheritance is more valuable than whatever else life might have to offer. “Ghost Town Anthology” lacks the human touch it needs to satisfy beyond its symbolism, but if Côté’s 96-minute curio takes far too long to thaw, it’s never more spookily enthralling than in its final moments. It’s then — after a winter’s worth of haphazard and half-sketched build-up — that the film dives through the looking glass and leaves Simon, Mayor Smallwood, and the rest of the cast to see if they can make sense of this brave new world. Irénée-les-Neiges might be a ghost town, but some deaths are just new beginnings in disguise. “Ghost Town Anthology” premiered at the 2019 Berlin International Film Festival. It is currently seeking U.S. distribution.